'Tenteko' is an onomatopoeia of the drumming sound. Please listen to the sound of 'tenteko'. 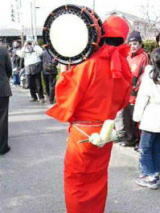 Tenteko Festival was started in 859. In this year, rice fields in Niike area were selected as Shinden (rice fields for gods) for the Daijo-sai. after the enthronement of an Emperor of Japan. to Ise Shrine by Emperor Seiwa. 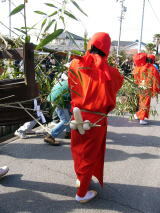 This festival was originally a rice planting ritual. Then it changed to a rich harvest festival and has been kept until now. 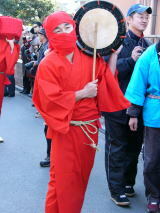 and it was designated for a intangible cultural folk asset of Aichi Prefecture. 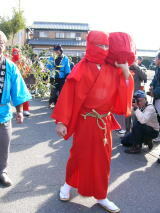 The parade of the Tenteko Festival starts from near Niike-cho Kominkan (comunity center) at 1: 00 p.m.
order of the parade . 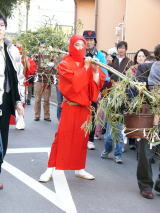 Stars of this festival are six yaku-otoko with red kimono and masks. 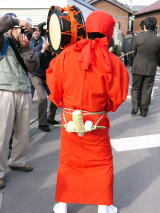 It is said that a red kimono is a relic of bygone days when rice planting had been thought very sacred work. 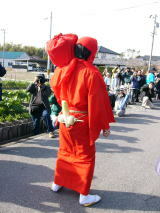 and that wearing a red kimono or hiding one`s face with a mask was a sign of god. Farmers transformed themselves to gods and had rituals of rice plantings. then they took their roles. The first three men put phalluses made of radish on their hips. They thrust their hips in time with the beat of a drum. Male is likened to a seed and female is likened to a rice field in Japan. So their action shows sowing and vital energies. and raw fish (bora/mullet ). They show the style of lunch time during the rice planting season in old days. At that time, farmers usually had meal twice a day, breakfast and supper. They have bamboo brooms to scatter ash. If the ash fall on you, it means that you got talisman. Take Meitetsu express bound for Nishio. Change the train at Nishio Station to the local train bound for Gamagori. Arrive at Nishio station at 11:29 a.m. The train leaves at 11:47 and arrives at Fukuchi station at 11:50. Get off the train and cross the tracks and turn to the left along the tracks. Cross the street and go straight. You will see white guardrails and greenhouses. Cross the street with traffic signals and go straight. You will find many flags of the shrine and thick trees on the right. That's the Hachiman Shrine yard.